During the course of the 2002-2003 winter, the A-League/Conference crossover league was set up, partly as a diversion for A-League fans to have some footy to follow during our off-season. The Conference is the next level of football below Division 3 in England -- a league that is semipro but still generates decent attendances and interest. 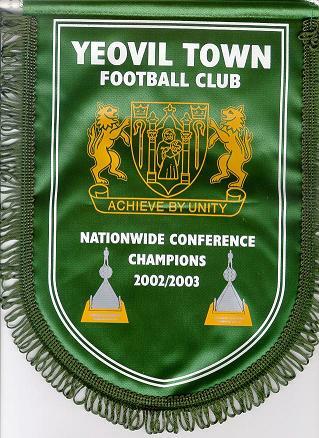 Our chosen club in this competition is Yeovil Town FC, who went on to win the Conference in style, and earn promotion to the 3rd division and fully professional football for the first time in the clubs 100+ year history. Archives/past issues of On To Victory fanzine can be found online at On To Victory site. 2004-2005 Results: Yeovil win Coca-Cola League 2!!! -- in just their second season in League football, Yeovil win the Coca-Cola League Two (fourth tier) and win automatic promotion to League One to face the likes of former European Champions Nottingham Forest next season. Phil Jevons led the way with 29 goals in 52 appearances, 27 of those goals coming in the League.